Menu Path: TSR > Settings > User Account. Step 1: Enter username if empty. Step 2: Enter password if empty. Step 3: Enter server address. The server address is automatically taken from setup data. Step 4: Check/Uncheck SSL Mode, then click on “Test Server Address” button to verify that the server address is valid. Step 5: Enter web interface. The web interface is automatically taken from setup data. Step 6: Check/Uncheck “Do not show warning when submitting an entry” option to show/not show the confirmation dialogue when submitting a time entry. Step 7: Click the OK button. Menu Path: TSR > Settings > What to Synchronize. Step 1: Check/Uncheck the “Setup Data (Organization, Project, Activity, Etc)” option to retrieve/not retrieve this data from the TSR server when synchronizing. 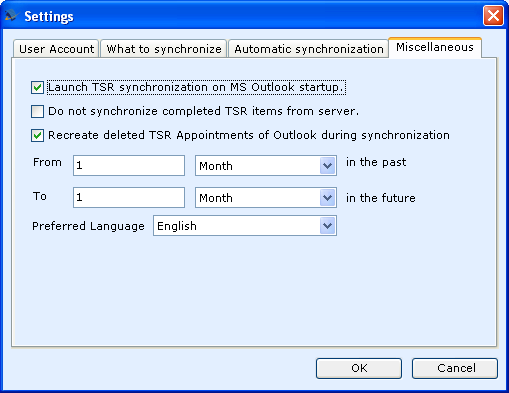 Step 2: Check/Uncheck TSR Items to synchronize appointments with TSR info. Step 3: Select the Calendar folder to use with TSR. 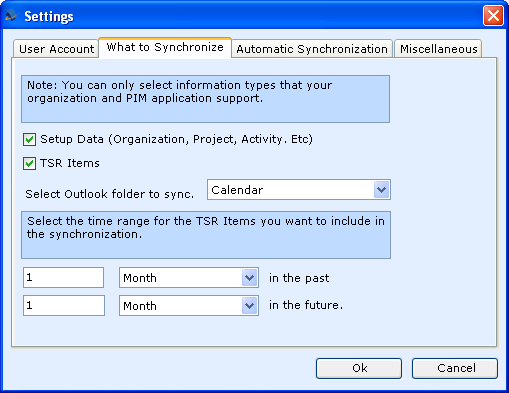 Step 4: Select the time range for the TSR Items that you want to include when synchronizing. 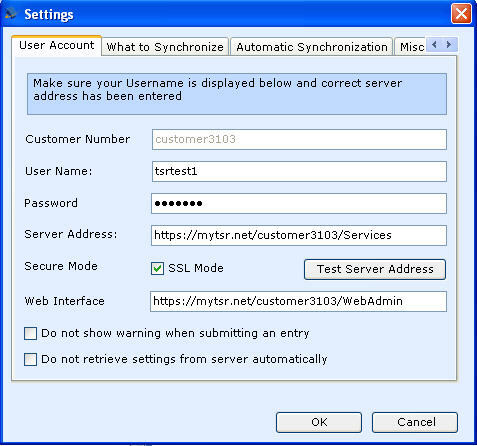 Select “Do not synchronize automatically” to prevent the system from synchronizing automatically with the TSR server. In this case, you will have to synchronize manually. 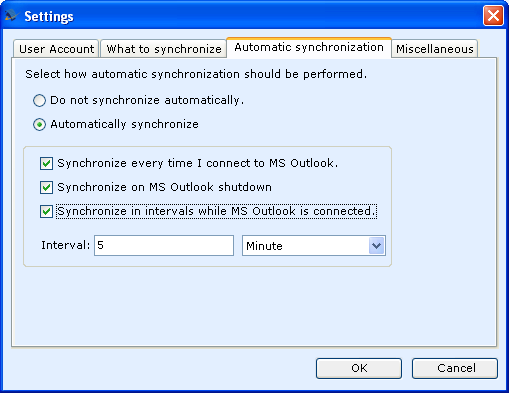 Select “Automatically Synchronize” to allow the system to perform the synchronization automatically. Then select when. Step 1: Select and enter the necessary values. Step 2: Click on the OK button.